Last fall I received the kindest invitation from the Inuvik Quilting Guild to come visit them for a lecture and two day workshop. This was a major thrill for me as I love the north, but haven't had a chance to visit the Yukon or Northwest Territories since I worked there as a geologist in the late 80's and early 90's. I didn't hesitate to accept the invitation for a March visit. After seeing Cheryl's blogposts from her trip last year, I knew it was an incredible opportunity that I didn't want to miss! Plus we were completely ripped off winter-weather-wise in Vancouver this year and I was anxious to feel the cold in my lungs. The lure of seeing northern lights was pretty strong, too (I'll tell you right now that it was just my luck the BEST lights of the past 10 years appeared the week before I got up north and it was cloudy at night during my visit, so no dice on the northern lights this time). 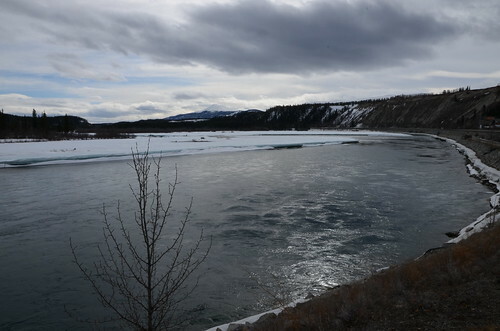 The mighty Yukon River in Whitehorse, YT. 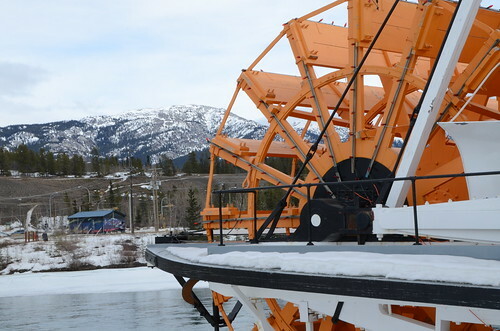 The S.S.Klondike paddlewheeler museum vessel, Whitehorse, YT. As luck would have it, my journey required an overnight stay in Whitehorse, YT. I loved that town in the 80's and it hasn't changed that much (at least the downtown). I enjoyed Main St. shopping and meeting the lovely Viv, who I've known online for several years through blogging. She was teaching a course that night at the impressive Bear's Paw Quilt Shop and invited me to stop in and meet her students. I just love the shop tag line: Compassionate care for the quilt addicted. Here's some reference material for you. Previously, Norman Wells was the furthest north I'd been for some permafrost slope stability research in '90 and '91. 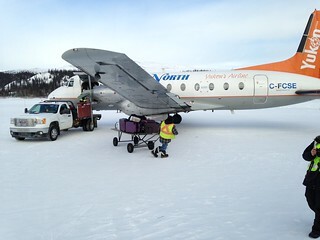 The next morning, I caught an Air North flight that would take me to Inuvik, via Dawson City and Old Crow. The twin prop Hawker Siddeley airplane refueled at each stop, so passengers have to get off, walk across the runway and wait in the little airports for about 20 minutes before taking off again. The air hostess wears a jumpsuit and parka on this flight! It was a gorgeous day for flying, with clear blue skies and exceptional views. 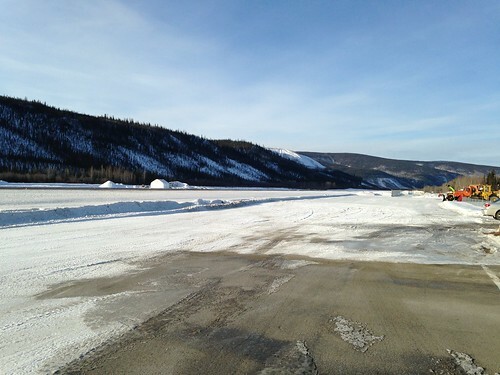 The snow-covered airstrip at Dawson City, YT. 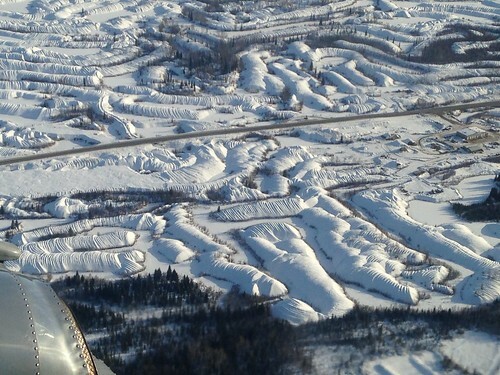 My very first field job in '88 was out this way near Dawson City...these are the tailings piles of huge dredging machines that dug up the Kondike River bed searching for gold. They look much prettier covered in snow! 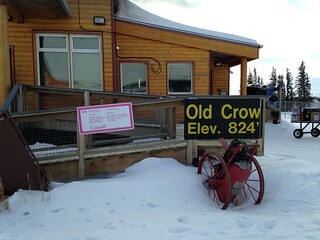 Next stop, Old Crow, where the luggage is literally man-handled and your taxi is more than likely a snowmobile. 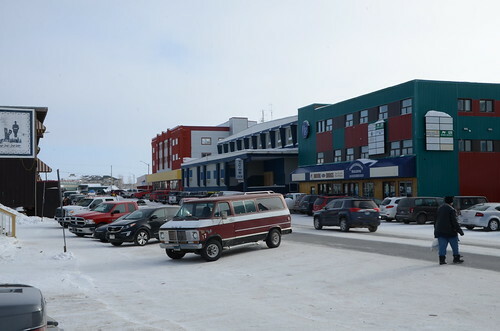 I arrived in Inuvik by mid-day to a very busy airport and town. It was the first day of the annual Muskrat Jamboree! 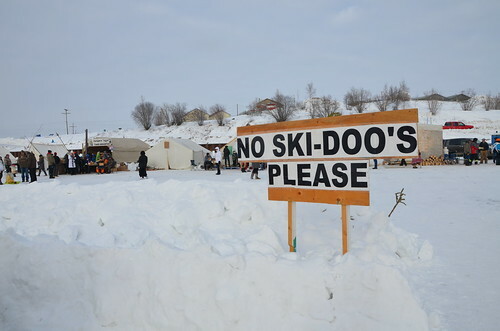 This is a celebration held in many northern communities. In Inuvik it marks the migration of the domestic reindeer herd to their summer grounds (in the '50's, the Canadian government was worried the northern people were going to run out of caribou, so they imported a reindeer herd from Scandinavia that is still going strong). Other events over the weekend included snowmobile racing, dog sled races, dancing, tea-brewing (contestants have to light a fire and boil water with no more than 10 matches), needle and thread (teams of 1 man and 1 woman run to meet each other and thread a needle), hammer and nail, log sawing and yes, muskrat skinning. 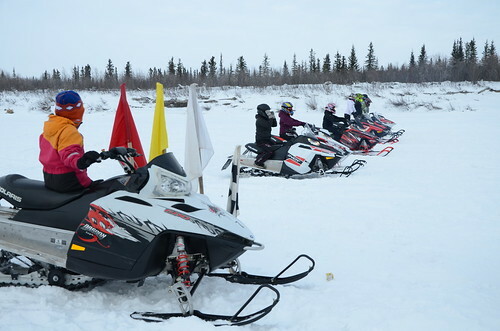 All of the activities took place either on the frozen Mackenzie River ice road or at the beautiful new school gymnasium. Thanks to my generous host Shona, I was able to catch several activities during our workshop lunch break and in the evenings. 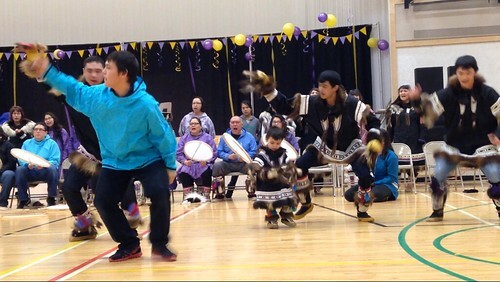 I was fortunate to see the amazing Inuvialuit Drum Dancing group perform (performers range in age from 3 to 92!). There is a video in my Instagram feed you can watch. 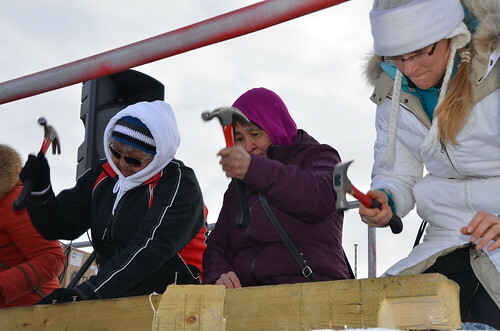 The ladies were very serious about the hammering contest. You have to completely drive a nail with your left AND right hand. The woman in the black jacket won! 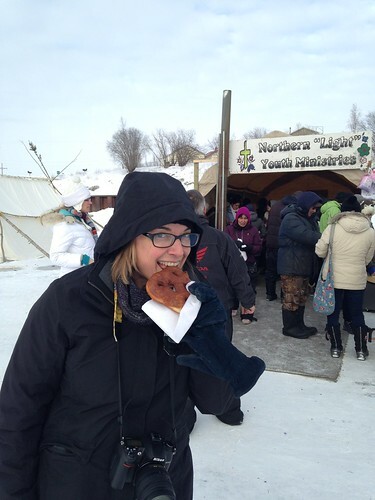 Here I am trying an "Eskimo donut". Shona made me. So now you've got a bit of an idea of what was going on all around while I was in town. Now to the quilting! 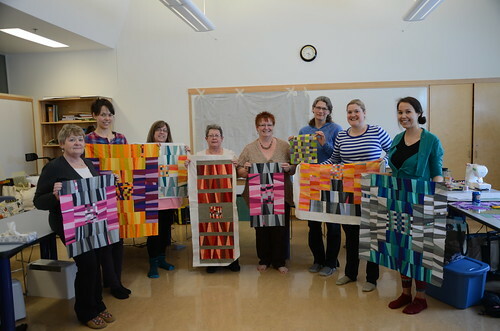 It was a busy weekend for family activities, so I was very happy that 8 members of the guild were keen to spend Friday night, Saturday and Sunday learning about modern quilting, improv piecing and improv straight line quilting. On Friday I gave a brief lecture and trunk show of some of my work and projects from Make It, Take It. Then we had a look at fabrics and finalized selections so that people could get cutting so they'd be ready to go the next morning. Everyone worked on their own versions of my Temperature Check quilt. 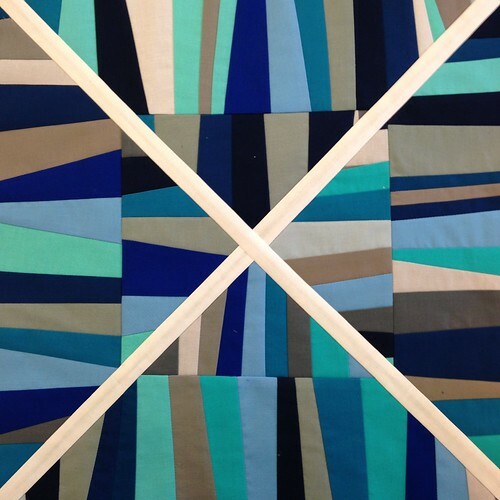 This workshop is so much fun to teach - I just love to see how different student's colour choices play out as the quilt is constructed. This is a pillow cover I put together over the weekend to illustrate a different option/design for piecing the wonky borders together. Megan brought very similar colours to class. We all loved her curving checkerboard! Linda, Sara, Joanne, Bev, Arlene, Jody, Shona and Megan show off their work. Bev decided to make a tablerunner and placemats! Shona used her hand dyed fabric which was beautiful. 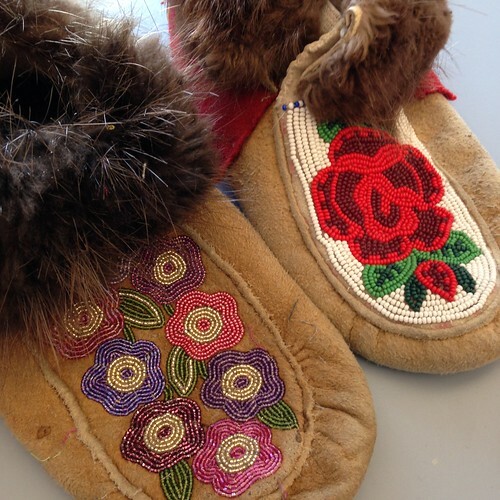 The ladies also shared some stunning traditional beadwork on slippers, mukluks and a scissor keeper (that included moose hair tufting). 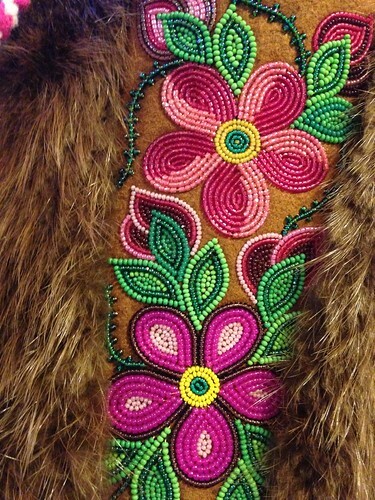 Beadwork on moosehide with beaver fur accent. 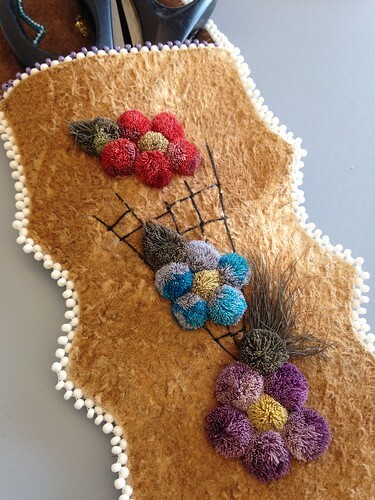 moosehide scissor keeper featuring Caribou hair tufted flowers. 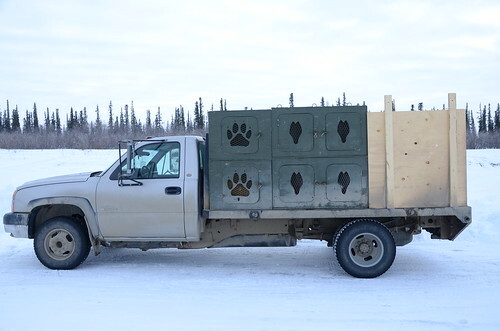 Made by Lillian Wright from Inuvik, NWT. 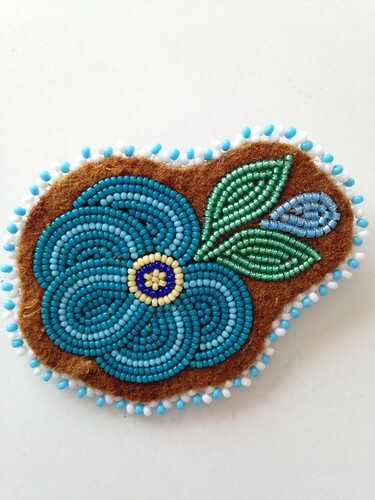 The guild gifted me this stunning beaded moosehide brooch that I will cherish! It smells like campfire from the natural tanning process and I absolutely love it. The beading is exquisite (also by Judy Lafferty). 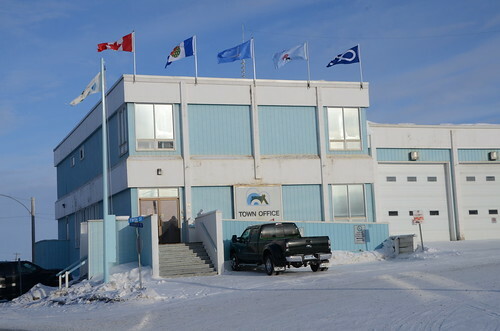 The municipal office where I picked up my Arctic Traveller Certificate. 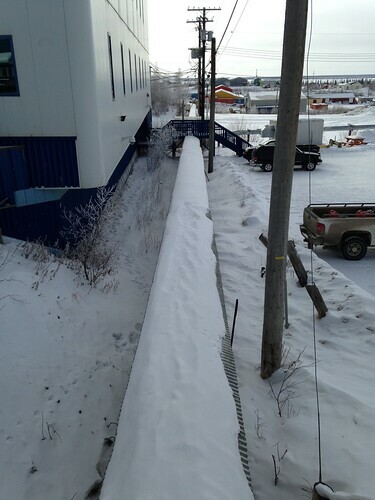 All of the water pipes have to run above ground from building to building due to permafrost. This affects the roads in town (see the stairs & bridge over the conduit? ), so sometimes you have to drive an extra block before you cross into the next street. Taken for all my quilting librarian friends. The head librarian, Bev, was in my class! I went in an igloo! For reals! No one is actually using this igloo, it was built for the Sunrise Festival welcoming back the sun on January 7th after a month of total darkness. 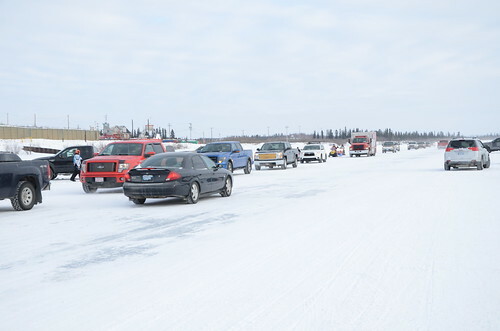 Traffic jam on the ice road as people come back to town after the ski-doo races in time for bingo! It was a $20,000 jackpot, after all. 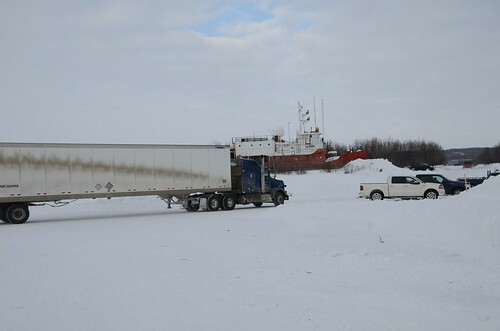 Two things you don't see often: a transport truck driving on a frozen river ice road and a Coast Guard ship high and dry on the shore. 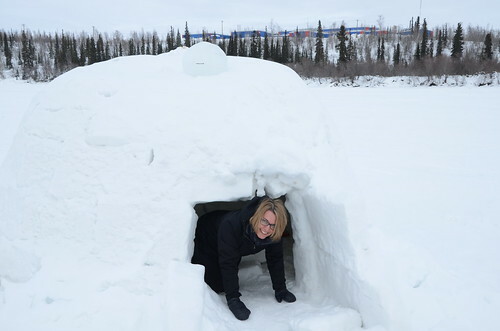 I hope you enjoyed this glimpse into Canada's far north! 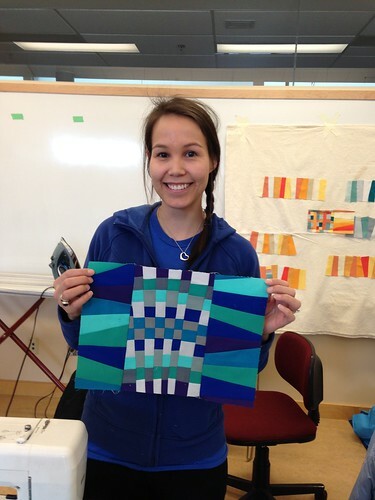 The main thing you need to know is that quilting is alive and well a few degrees above the Arctic Circle; there are about 50 members of the guild (Inuvik has a population around 3300). Everyone was so warm-hearted and welcoming. Every person I passed on the street smiled or said a greeting. I love northern community. 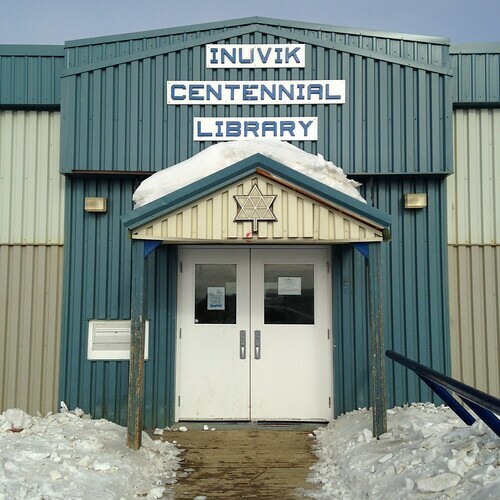 Inuvik is a completely government-planned town which was surveyed and established in the 1950's after repeated annual flooding and erosion of the traditional settlement of Iklavik in the delta. 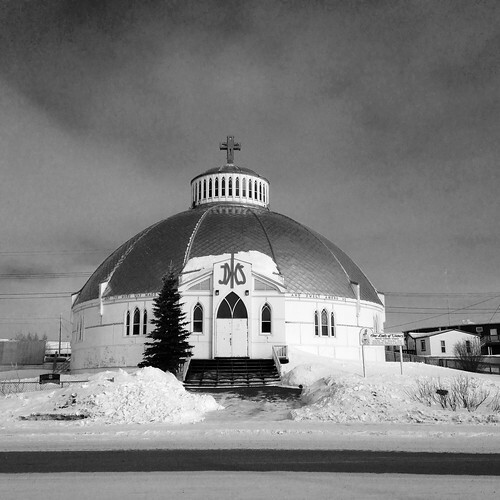 You can read more about the town and the Gwich'in and Inuvialuit first peoples of the Beaufort-Mackenzie Delta here. Great show and tell about the north Krista! My uncle and family lived about two hundred fifty miles north-west along the Alaska Highway working as a lineman. One summer they drove down to Vancouver for a visit and then we drove up two weeks later and drove altogether to Dawson City. Gravel road all the way from Dawson Creek to Dawson City and back. Definitively a memorable trip in the 1960's! Thanks for the great photos and memories of the North. That's really an amazing adventure, which we cannot have here in Europe like this. You're a very lucky girl. Thanks for the pictures! Fantastic photos...even if I didn't enjoyed looking at all that snow again...am so happy it finally have started to melt here...Wohooo... Amazing that living at almost the same latitude...the arctic circle it still differs...we for sure don't have permafrost .. One thing that I absolutely love around here is the midnight sun...light all day and night!!! Thanks for showing your lovely pics! I can barely get my head around this - so much snow, all the time, and people live there??? It seems crazy. Although those donuts and beadwork would soften the blow a bit for me. Sounds like you had an amazing trip - it's so cool that your teaching skills take you to these fantastic spots, and that you get to explore them for us. wow. What an amazing trip! I can't imagine living in that kind of cold. Looks amazing though. Thanks for sharing. I love that quilting brings so many women together and connects many cultures. What a great adventure. What fun you had! Fab photos and everyone in your class did lovely work! What an adventure! So interesting. 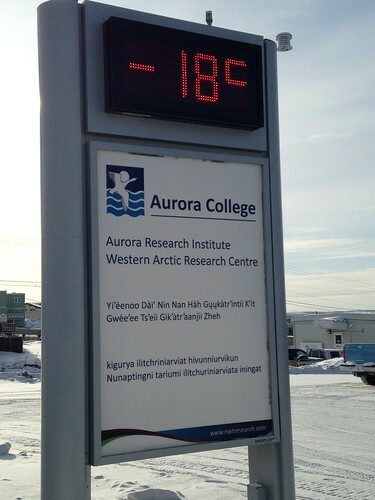 I really enjoyed this glimpse into the far north. What an amazing trip! I have always wanted to go north, only have ever gone as far as Edmonton and I know there is WAY more to explore! Thanks for sharing! I love how quilting cant take us anywhere and everywhere! You were there for the excitement...minus the Northern Lights (drat)! Looks like you had a fabulous time! Amazing the creative work that will get done when it is totally dark and cold enough outside to freeze your lungs!! Some kind of hobby would be essential to maintaining sanity and their bead work is exquisite! Nice to know that quilting is alive and well way up north!